Figure 1: The figure has a ton of detail and great color. 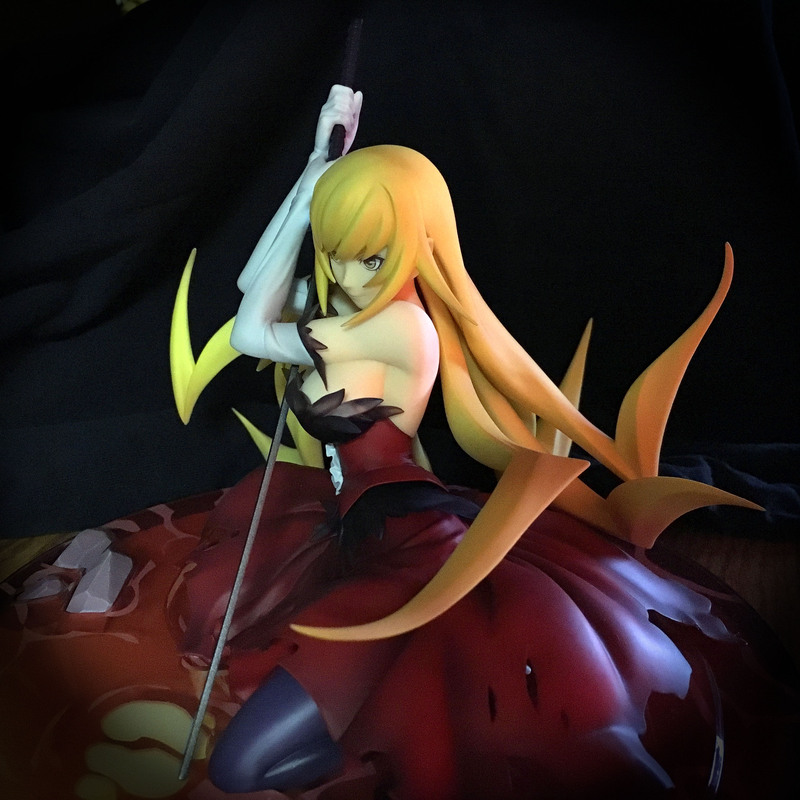 Back in May 2015, Crunchyroll offered the pre-release of the Good Smiles Company Kiss Shot Acerola Orion Heart Under Blade. She’s the vampire from the Monogatari series. The member cost was $104.99 (which is the same cost as it now). I received it late last week. Was it worth the price and wait? It’s a big figure. The figure sits on a base that’s 8 inches in diameter; the figure’s five inches tall. With a price tag over $100.00 US and the size, you might expect a lot of detail. And you’d be right! It’s beautiful. Figure 1 shows how the Kiss Shot looks from the front. The figure depicts her crouched in orange/red tinted water, leaning on her sword, a look of determination in her eyes. In Figure 1, you can see the level of detail in the sword hilt; you can almost see the stitching in the fabric (except, of course, that the whole figure’s made out of PVC). From the figure’s left, you can see even more details — almost perfect skin tones, tattered skirt, and blonde hair. Figure 2 shows Kiss Shot from her left. You can see her hair streaming out behind her; you can see some stones in the water on the left. When the figure arrived, it was in four major pieces: the base, the sword, her lower half, and her upper half. The sword’s hilt detaches so you can more easily assemble it in her hands as shown. The only struggle I had was re-assembling the sword. It’s a tight fit in her hands, and I was afraid I’d snap the small plastic tab. Carefully adjusting the blade’s angle helped reduce the stress, and you can see the results! Figure 3 shows the collectable from her right side. I love the level of detail, like the creases in her white gloves, the almost visible fluttering of her hair ribbon, and the articulation of her fingers. Figure 3: From the figure’s right, you can see the details in her gloves and hair ribbon. The figure was safely packed in its box. It was easy to open, and after removing the tape that held the inner packaging together, removing the figure was a breeze. 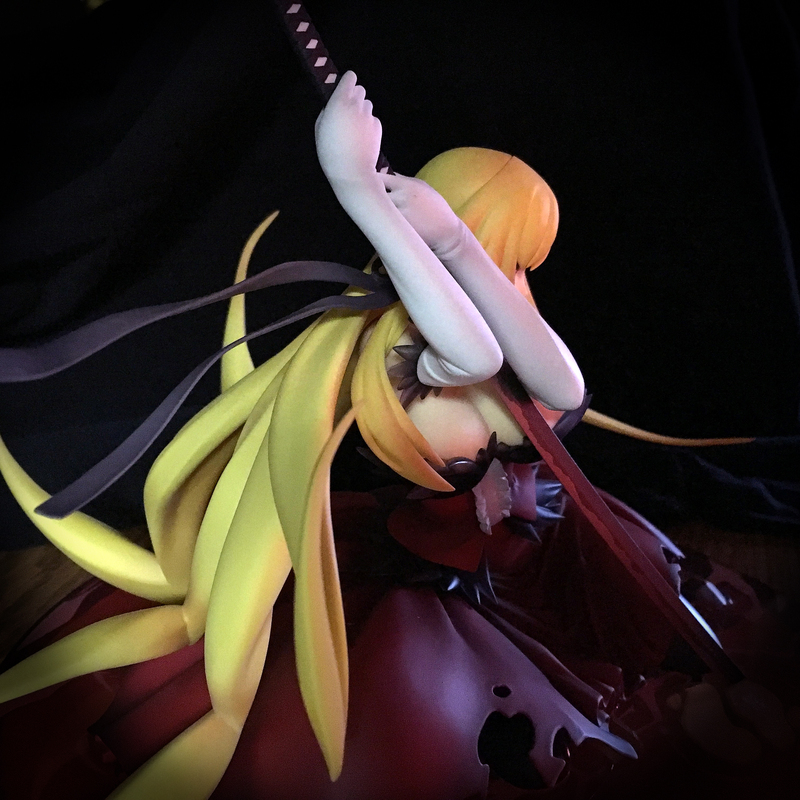 So: was Kiss Shot worth the price? Was she worth the wait? I have an Associates relationship with Amazon, so you can buy this figure here for about $126.46. Of course, I’d love for you to use this link! If you’re budget conscious, you can also order it through Crunchyroll for about $104.99 if you’re a member or $109.99 if you’re not a member. I’ve had great luck ordering products through both channels. So, what do you think? Is this something you’d like to buy?